What Do You Get With ROAVR? Have you used drone crews before? You’ll probably be all too aware with just what can go wrong then… see below to find out why we are different. …One of the biggest problems when working in production today is the overwhelming pressure for aerial content at the right price. You see its one thing to win that production project, but its another to get a drone crew on location for the right price that delivers the right quality. And I don’t know about you as an individual that’s trying to run these projects, but for me getting top quality drone crews at the right price is a massive pain. As you’ve probably seen, people are beginning to realise that they’ve been hoodwinked by the jargon into believing that anyone can shoot from the sky as the deadlines for the shoot day approaches and budgets bite the dust. Getting the perfect shot from the sky at the right price with top quality crew is harder now more than ever. Maybe you’ve seen some of those hard earned rushes fall flat on their face, as your one time shot becomes victim to pilot error, drone downtime or battery blunders. You’ve probably experienced, being left out in the cold facing the cold harsh realities of a drone operator “having tech issues” as they scramble around trying to get the drone to take off. It seems that nearly all of us in the production business have experienced something like this from time to time. Truth be known, it’s at times like these that experience in the sky is king. Pretend pilots dumping regulations and best practice in one last desperate attempt to cut costs and win work. Leaving nearly every production shoot skating on thin ice and open to legal litigation without a second thought. Therein lies the big problem, the problem why most end up between an inevitable rock and a hard place. Somewhere in my experience, of utter mad panic from schedules, rock bottom budgets and the ever increasing demands for high quality content. Its exactly why in my experience, something always has to give. And when something has to give the lowest price drone crew is usually given a shot. For most that means schedules stalls, shoots stall, the production stalls. I suspect that you want to use a better quality, higher end drone crew, but when it comes to buying those on a day by day basis its virtually near impossible to balance the books. Thats exactly why I want to have you consider the possibility that there is a NEW way for you to work with a drone production crew..
…No more worry of finding crew with the right equipment at the last minute. …Leaving you to concentrate on the main production. 5 x DJI Inspire 2’s - so that never again will you be left hanging on location when the drone operators equipment fails. X4s camera system - so that you have a low cost option for smaller shoots and still photography. X5s camera system - with 4 lenses so that mid-level productions and TV projects can be serviced to a high standard, no more embarrassing quality conversations on location. X7 camera system - with DJI prime cine lens kit, so that you can offer the client the latest, highest quality Hollywood grade rapid deployment system and a real alternative to heavy lift drones. Ability to shoot in H.264/H.265 so that online and TV projects can be served correctly. Ability to shoot in Cinema DNG and Pro Res Raw so you can offer aerial content for features and VFX plate work confident that the DOP will be happy. A Freefly Alta drone with Movi aerial gimbal system for heavy lift projects so that the DOP can lift his camera and lens package of choice. After attending many conferences and shows worldwide, it was clear this was the system that gets the best results. Connex HD downlinks so that all on location can get high quality HD downlinks to monitors and the video village. Atomos Directors monitors so that the Director can guide imagery capture if required and instantly playback shots. Honda generators for onsite power so that never again are you left in the cold waiting for batteries to charge. DJI fast charge battery boxes for rapid re-charging on site to enable the DJI Inspire 2 drones to be rapidly replenished with batteries on hectic shoots. Tripods and lighting stands for monitors, no more chasing location or the camera department for stands for the drone crew. On site drone DIT capability using Apple Mac’s so that low to mid-level productions can have the drone data managed for them on site. VW production vehicle with running water, inverters, fridge and kettle so we can keep our crew warm, fed and happy but more importantly, the equipment can be transported safely. 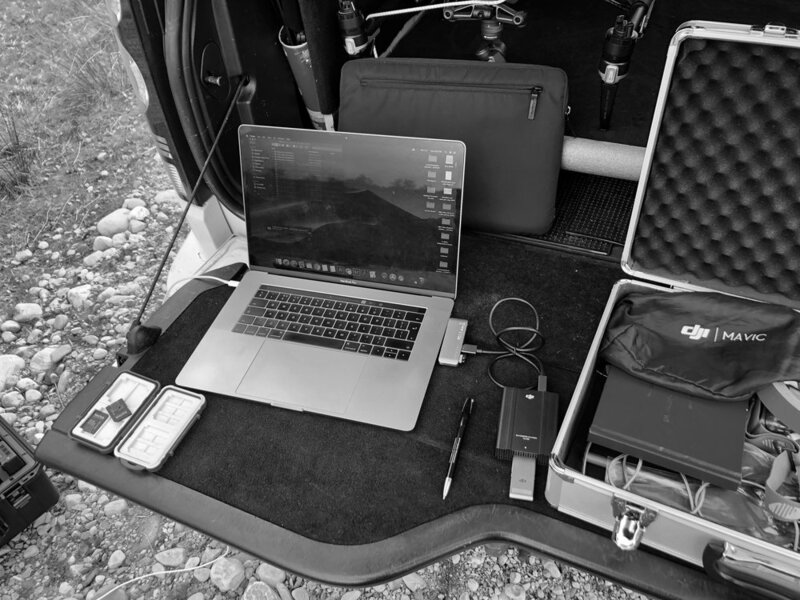 Lacie hard drives and SSD’s for rapid onsite file transfer, no managing the drone crews cards, we will create one simple folder on a dedicated drive for transfer. Sat phone for communication in mountainous areas, we know Scotland, often the crew ends up scattered and the shoot stalls due to poor communication. Problem solved with our Sat phone. Walkie Talkies proper high quality licensed walkie talkies so we can all keep in touch. Camera hire through trustworthy and reliable rental houses, we have accounts at the two major camera rental houses, no delays waiting for parts to get the drone to work. In-house Sony A7riii, Sony A7r and Panasonic GH4 camera systems, no additional hire costs on mid-level productions putting full frame aerial stills within your reach. No compromise on quality. Online booking system, so that the aerial crew can be managed smoothly, efficiently and consistently 24HRS a day. Online on demand access to all paperwork and risk assessments, so that you no longer have to take time out to chase the drone crew for paperwork on the run up to the shoot day 24HRS per day. Legislative compliance guaranteed, our Director is a best selling author and has consulted on drone regulations for five-years, we are always up to speed so you don’t have to be. Office support - studio/office in Inverness for production support so that the drone crew doesn’t spend your shoot day lining up the next job or checking emails all day. Unlimited aerial filming support through our dedicated app, got a question? Ask away. You own personal Account manager so you don’t get pushed from pillar to post on the run-up to the shoot day and the process runs smoothly. We run several specially kitted out vehicles with workshop facilities, spare drones and battery charging capability so your shoot goes smoothly from start to finish. 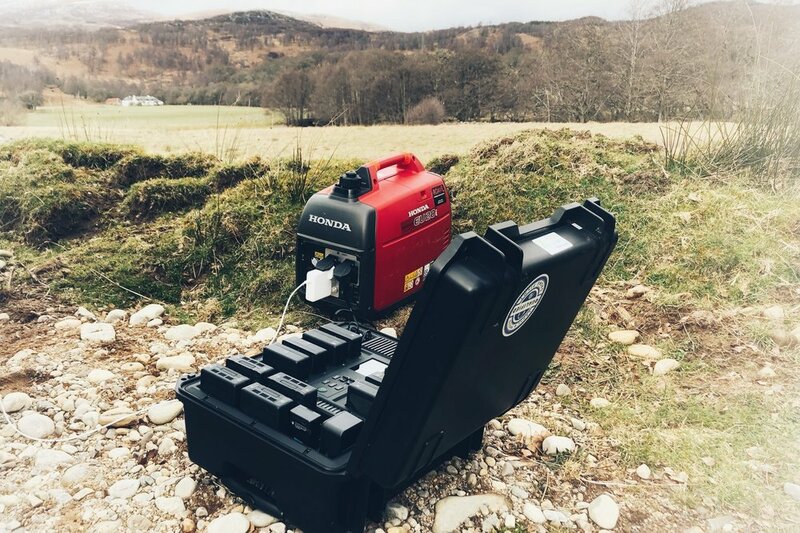 We carry enough batteries to film all day… BUT if your day over runs, we can charge 22 batteries on site quickly and efficiently as well as providing power for you to utilise. Full facilities to backup and wrangle our drone data. This means that by the end of the day you’ll have two copies of the drone rushes ready to take away. No more waiting around for that data.